When is a non-government a government? As I've been observing the continuing skirmishes between the European Union and various business (notably technology businesses), something struck me. On its simplest level, each of these skirmishes can be characterized as battles between a government and a business. We know what a business is, but I figured I'd ask myself what a government is - especially given the unique nature of the European Union itself. As a starting point, I looked at Merriam-Webster's definition. This definition basically talks about persons or systems or processes that "control and make decisions" for a political unit such as a country or state. The definition doesn't say anything about elections or citizens or democracy, because many governments in the world don't have elections or citizen participation; North Korea comes to mind. So based upon Merriam-Webster's definition, the people/systems/processes associated with Kim Jong Un constitute the government of North Korea, and the people/systems/processes associated with Barack Obama and Paul Ryan and others constitute the government of the United States. But are there other entities that "control and make decisions"? Even if you don't completely subscribe to conspiracy theories, there are non-governmental authorities that control and make decisions in my country. It's open to debate whether the Federal Reserve is governmental or non-governmental, but the three credit bureaus are clearly non-governmental. And those technical companies that are the bane of EU bureaucrats certainly make decisions that could be characterized as controlling. Take the "right to be forgotten." The EU government may proclaim that a certain person may be deleted from search engine results, but even if Google were to agree to delete those results for Europeans accessing google.com (rather than google.fr or google.es), the European can simply tunnel to a US domain provider and access google.com to see stories of forgotten persons. And if Google were to choose to eliminate European forgotten people from ALL of its sites, then it would be taking a controlling stance against governments of the United States, which are (at least theoretically) committed to freedom of speech. Oh, and Brexit could complicate the situation. Even if you have the best videoconferencing equipment - and most of us don't - a virtual presence cannot substitute for a physical one. This was borne out for me recently as I was taking my morning walk at work. I spotted a guy walking in a neighboring parking lot. One of his hands was holding a phone to his ear. As he talked, the other hand was pointing and making other gestures. And in this case, the other people on the call literally did not know what the caller's other hand was doing. You may object and say that the guy should have been on a video call rather than an audio call. But if he did that, he wouldn't be able to walk around the parking lot. And forget about walking around the parking lot if you're wearing VR goggles. Remember my July post that included employee speculation that Kmart's "path to profitability" was really a path to store closure? The speculation was that stores would close after the Christmas season. Well, it turns out that speculation was absolutely and positively wrong, according to Business Insider. My buddies at the Orange County Transportation Authority have announced an easy way for Orange County football fans to attend the Rams home game in Los Angeles this Sunday. Why would the OCTA go through this effort? Because there was a period when the Los Angeles Rams, despite having "Los Angeles" in the name, were actually based in Orange County. (Rita Moreno of Arte knows the feeling.) Despite the two decades during which the Rams were in Missouri, apparently there are enough people in Orange County who still love the Rams, and are excited about boarding a Metrolink train that will take them to Union Station; the fans will then take Metro to the Coliseum to see their beloved Rams. But Ram faithfulness has nothing on Raider faithfulness. I guess I never told the complete story about my trip to San Francisco for Oracle OpenWorld 2007. Oh, I alluded to it in a post at Ontario International Airport, and a follow-up picture post. In brief, that year I chose to fly to Oakland rather than San Francisco, and then take BART across the bay to the Moscone Covention Center area. When the Oakland Raiders were playing on a Sunday afternoon. You can guess who was on my Ontario to Oakland flight - it was me and the Raider Nation. This flight was a little more boisterous than your average airline flight, but it was fun. Of course, this raises the question - if Orange County fans are taking the train to Rams games, and if Inland Empire fans are (or were) taking the plane to Raiders games, are any fans from St. Louis also making the trip to Los Angeles? A year ago, a San Francisco 49ers touchdown run against the Rams would have been cause for despair at the Hot Shots Bar & Grill in suburban St. Louis. On Monday night, it was cause for celebration. About 50 or so patrons cheered every Rams mistake and every 49ers success during the Monday Night Football game, the first since Rams owner Stan Kroenke took his football team back to Los Angeles after a 21-year stay in St. Louis. And Brooklyn residents probably don't fly to Chavez Ravine either. I have previously noted that the "living wage" discussion does not extend to prisoners. Prisoners perform work, such as farming tilapia and fighting fires. And sometimes they get as little as 74 cents an hour for the work. Needless to say, the prisoners are not happy about this, and today prisoners in 24 states are participating in a strike. As even this call to action notes, sub-minimum wages for prisoners - or no wages at all - are Constitutional - at least in government prisons. Private entities have different rules sometimes. For-profit universities aren't having the best time of it. ITT Technical Institutes is shutting down, Marinello Schools of Beauty shut down earlier this year, and (in case you haven't heard) Trump University has issues. So why aren't people fleeing to the relative security of non-profit educational institutions? Because they have their own problems. I've already talked about Mount St. Mary's University's issues - partly due to privatization efforts, partly due to angering the faculty. But one way to take care of faculty issues is to close down a program, just getting rid of troublesome faculty. Six days before the start of the fall semester at Pacific Northwest College of Art (PNCA), a group of Master’s candidates and professors received an email from the dean of students informing them that their program was suspended and they would not be teaching or studying as planned. As a result, 17 accepted students and two longtime professors teaching in PNCA’s Critical Theory and Creative Research (CTCR) program were left disillusioned — and, in the case of the professors, unemployed. The college says the program was suspended because of under-enrollment and a delicate financial situation, but students and teachers claim CTCR was eliminated unethically and possibly in retaliation for expressions of dissent against recent changes in the school’s administration. The June 17 contract written for the co-chairs of the program required 13 qualified students enrolled with deposits by August 15, 2016 for the program to go forward. As of August 15, while 17 students had been admitted into the program, just five of those students committed to the program with deposits, and only one student actually enrolled. But even the PNCA's press release hints at disarray. The MA in Critical Theory and Creative Research was originally ​ launched in 2012. At the time, the founding co-chairs of the program were hired with a three-year contract. In 2015, in response to feedback from students about the accelerated nature of the program, the Graduate Curriculum Committee (a standing committee of Faculty Senate), re-envisioned the MA in Critical Theory and Creative Research as a two-year program and as a dual MA/MFA degree. Once the Graduate Curriculum Committee approved a two-year CTCR program, a search committee was formed to hire a chair for the new program. The founding co-chairs did not reapply. A chair was hired but withdrew in spring of 2016. In brief, the program started as a one-year program. After moves were made to change it to a two-year program, the incumbent heads decided not to apply, and the person who was hired to run the two-year program then had second thoughts. In April, Hyperallergic reported on a series of protests by PNCA students and staff after a group of adjunct professors was unceremoniously left without work for the coming school year. Perhaps Mount St. Mary's and PNCA are outside the norm, but all universities, whether for-profit or non-profit, are faced with the task of getting enough money to keep the doors open. Sometimes this means that the college president is pretty much a fundraiser and that's it. Sometimes it means that the schools use adjunct professors and teaching assistants to keep costs down. And sometimes it means grade inflation. This does not negate what I've previously noted - people who are forced to change their passwords end up choosing simple, bad passwords - but it is something to consider. I announced this last Monday, but perhaps you missed the announcement. So what is this? Basically, I'm hosting something on my Facebook page https://www.facebook.com/empoprisebi/ - a retrospective of posts from the early years of the Empoprise-BI business blog. Now I know that when I originally announced this on August 29, I didn't limit myself to the early years. But once I began going through old posts, I pretty much tuckered out after selecting a few posts from 2009 and 2010 (plus a few more from 2011 and 2012). 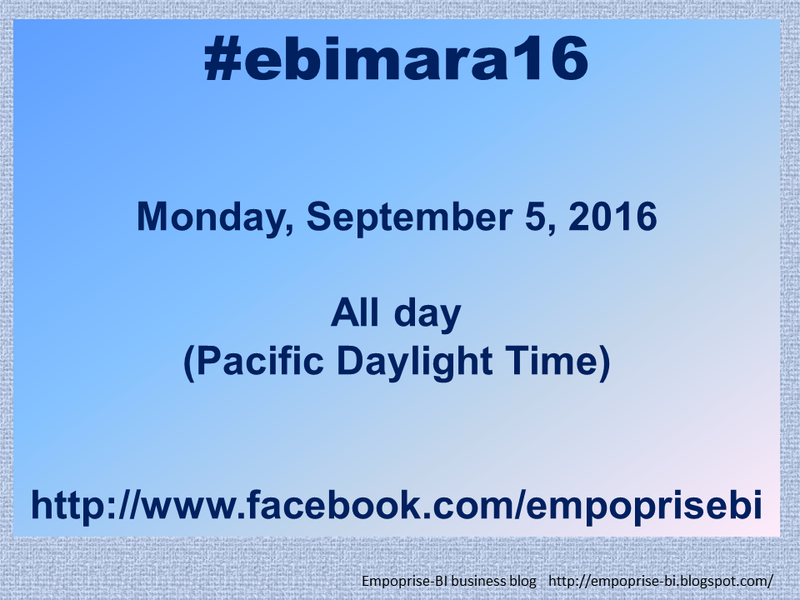 So if your favorite Empoprise-BI post was written last year, it won't be part of #ebimara16 - unless I change my mind. So what's going to happen? Roughly an hour after this post appears, or a little after midnight Pacific Daylight Time, links to old posts will start appearing at https://www.facebook.com/empoprisebi/. Some are serious; some are funny; some are out there; and there's one about baseball. P.S. 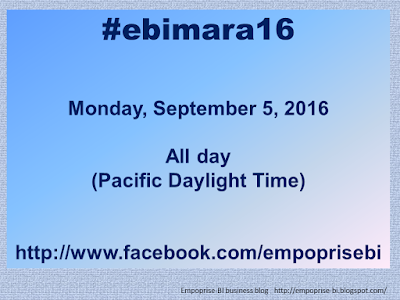 As of now, #ebimara16 is not a 24 hour event. It will only last part of the day...again, unless I change my mind. I finally revealed the Empoprises Rule of Fair Food! I've been hinting at it for a long time. But I finally wrote down the Empoprises Rule of Fair Food in a comment on Google Plus. Why did I reveal it now? Because Cara just shared a link to Eater's State Fair Food Generator. Unless you're Louise Hay, you've probably had problems with your appliances at some point. Luckily, there are people that can help, such as those at Just Answer. Now most people are stumped when they see a problem like this. But not you, the Empoprise-BI business blog reader. Perhaps you saw my 2009 post on the topic. (I just might include that post in #ebimara16.) Or maybe my 2010 post. Or my 2011 post. Or my other 2011 post. That one appeared near Thanksgiving. Or my 2012 post. Or my 2013 post. Well, since I've taken a couple of years' vacation from talking about oven temperature sensor probes that beep, it's understandable that the person above turned to Just Answer for help. You'd think that after years of this issue, they'd come up with a probe port that isn't sensitive to humidity.